As the Ukrainian Catholic bishops met in a private audience with Pope Francis Feb. 20, Ukraine was marking its first Day of the Heavenly Hundred Heroes, commemorating those who died in the Euromaidan movement one year earlier. Renamed the Revolution of Dignity, the four months of demonstrations in the Ukrainian capital, from November 2013 to February 2014, saw 120 people killed; Feb. 20 was the bloodiest day. But as Ukrainians poured into Kiev’s main square to rally for a future aligned with Europe and its values, they probably never imagined they would be drawn into an even bloodier conflict on their eastern border. Since war broke out in Ukraine’s east, the Ukrainian Catholic bishops have issued multiple calls for peace and humanitarian aid and have sought to sound the alarm on the dynamics of the conflict. But their cries, many say, often have fallen on deaf ears. The bishops decided to try once again during their “ad limina” visit to Rome, Feb. 16-21. 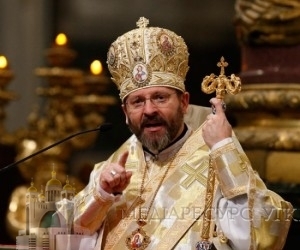 “We’ve come on this ‘ad limina’ visit … to meet the Holy Father and … to tell the whole world in a loud voice: Do not be indifferent, because indifference kills,” said Archbishop Sviatoslav Shevchuk, major archbishop of Kiev-Halych, in his homily at the Basilica of St. Mary Major. The Ukrainian bishops had invited the Ukrainian diaspora in Rome to join them at the basilica to pray for peace in Ukraine, one day ahead of the bishops’ audience with Pope Francis. The church held more than 500 people, with every seat filled and people lining the aisles. Ukrainians are among Italy’s largest immigrant communities. Speaking in both Ukrainian and Italian, the archbishop emphasized the commemoration of the Euromaidan and told the assembly that the 120 people who died were “not indifferent.” He added that Ukrainians demonstrated they were not indifferent in the face of violence, injustice and disregard for human life and dignity. He warned that the conflict in the country’s east is not just “a Ukrainian crisis” but one with global implications. Olga Filipchenko, an Orthodox Ukrainian who has lived in Italy for 12 years, said she wanted to join her Catholic friends in praying for peace. “I never thought there would be war in our country. We are a peaceful people and we did not expect war,” she said. She spoke of being far from her family, who live about 150 miles from the fighting front. I wake up every morning with fear, wondering if my family is OK, checking the television and the newspapers, to see if the war has come to our city,” she said. Archbishop Shevchuk spoke with reporters about the Ukrainian pastors’ concerns for the refugees and victims of the war. “We are witnessing the biggest humanitarian catastrophe in eastern Europe, after the end of the Second World War,” he said, citing more than 2 million refugees and 6,000 deaths. He appealed to the international community for “help to stop the aggression” and to organize humanitarian aid.